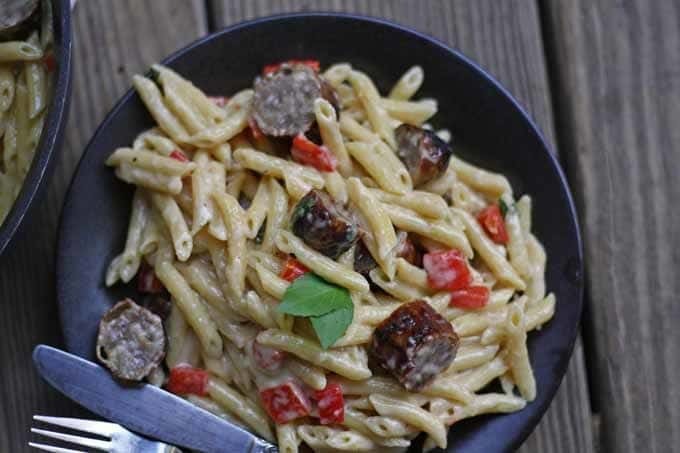 This brown butter alfredo pasta with roasted red peppers and sausage is perfect for Sunday dinner and a great way to use up leftover grilled sausage. I was away on a long weekend vacation to western Wisconsin (more on that soon) and I purchased a bathing suit to take with me. First time wearing a bathing suit in 4 years. So, of course its only appropriate for me to post a recipe for alfredo sauce and pasta after that mental catastrophe. It’s because of recipes like this one that I haven’t purchased a new suit, let alone put one on in years. It’s okay – I like food, I write about food, but that’s unfortunately starting to show. I do believe that it’s okay to eat all types of food as long as you do so in moderation. This is hard to do when you starting eating this brown butter alfredo sauce because its delicious. 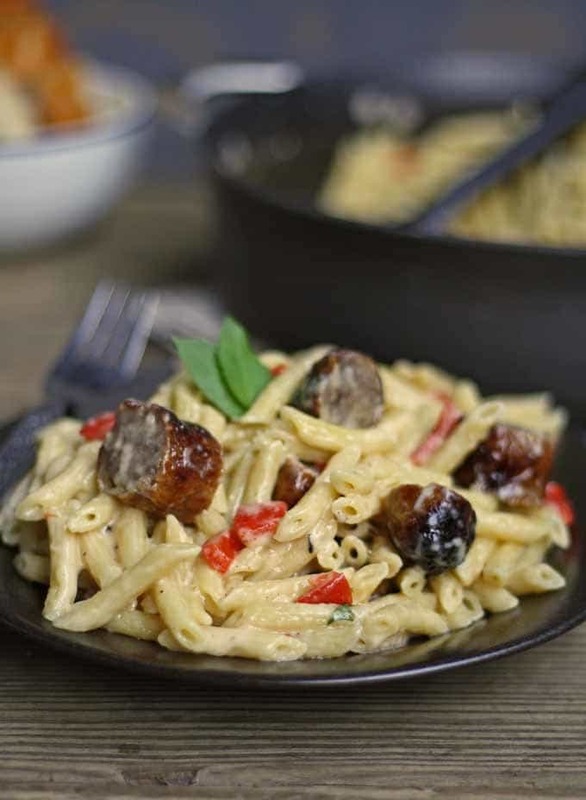 I tweaked this brown butter alfredo sauce recipe from Lauren’s Latest a little and added the roasted red peppers and sausage. Mr. B. and his meat – I swear my carnivore husband has a personal vendetta against meatless Monday’s. 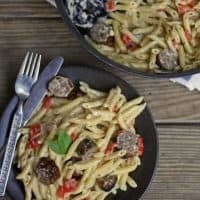 I originally intended to use Italian sausage – unfortunately I was tired when I made this and we had grilled both Italian sausage and bratwurst the night before. I totally screwed up and put the bratwurst in it instead – and it was delicious. 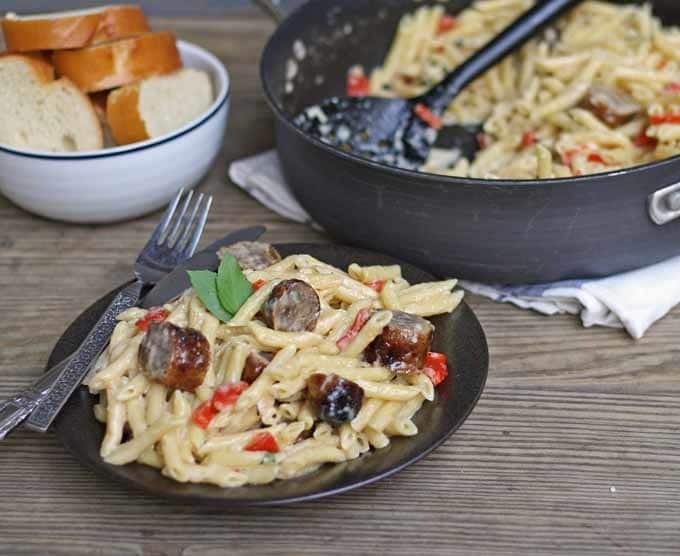 I would suggest either brats or Italian sausage when you make this (but if you are adventurous and try a different sausage type (knockwurst, Polish sausage) let me know. 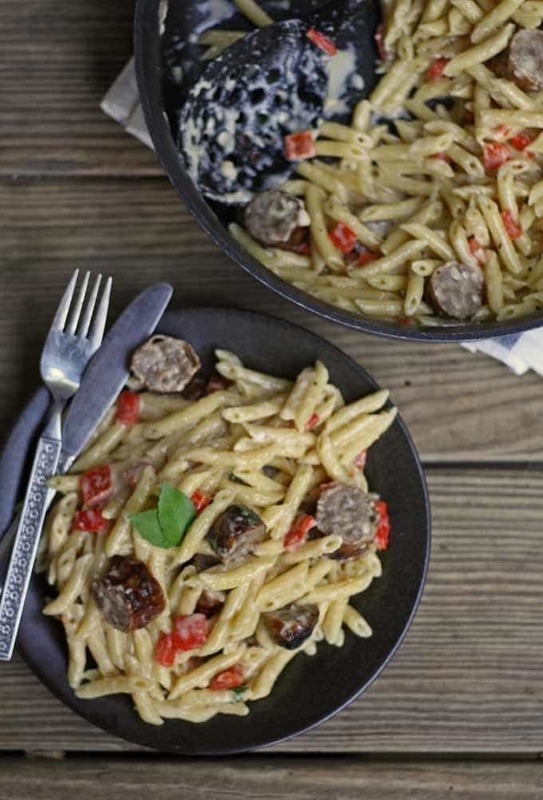 Make this brown butter alfredo pasta dish when you have leftover sausage from a weekend of grilling, or just when you want a hearty meal. Bring a large pot of water to boil. Cook the pasta according to package instructions to al dente. Once the butter turns a medium brown color (and has a nutty smell), add the cream and garlic. Stir until combined. Add the cheese, mix until incorporated and smooth. Toss with the cooked pasta, sausage, red pepper and basil. Looking for more pasta recipes? Try this cheesy tomato pasta skillet or my spicy chicken romano pasta! This sounds and looks so good! Thank you for this recipe. Oh my goodness this looks absolutely heavenly! We eat a lot of penne around here, but mostly with chicken. I think when I attempt this I’ll put a spicy, Cajun spin on it! Thanks for sharing, I can’t wait to give it a try! Looks delicious! Thanks for sharing at the “What’s for Dinner” link up! This looks to die for!!! 🙂 Pinned! I adore everything in this dish, alfredo, brown butter, sausage, peppers… MMMMM! Thanks for sharing on Creative K. Kids Tasty Tuesdays. I hope you will join us again. My daughter hates red sauce. This is a perfect recipe to try that I think she’d enjoy. Thanks for sharing with us at the Inspiration Spotlight party. Pinned & shared. See you again soon. This looks scrumptious! I’m always picking up sausage when it’s on sale and then trying to think of ways to use it! Problem solved! Thanks for bringing this by Throwback Thursday last week – Sorry I didn’t get a chance to comment earlier! !